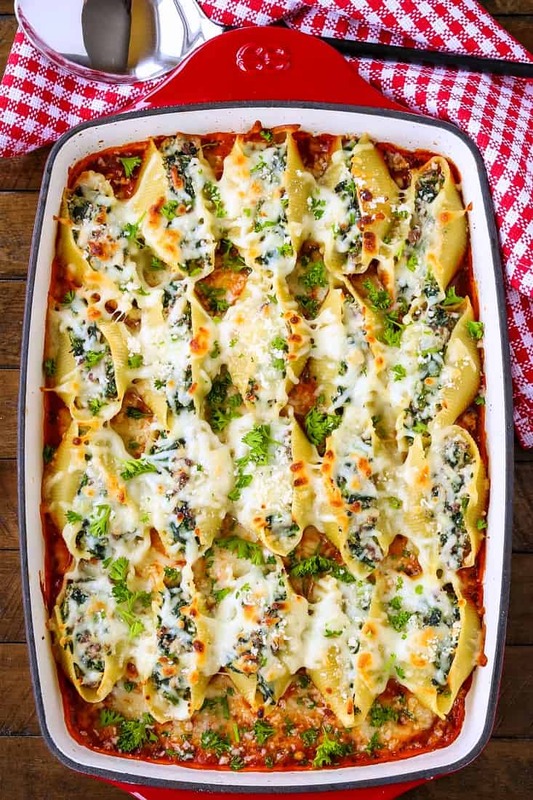 Beef Stuffed Shells are perfect for a Sunday dinner, but easy enough for a weeknight dinner too! This pasta recipe is comfort food times ten! Comforting pasta recipes are always on our menu. 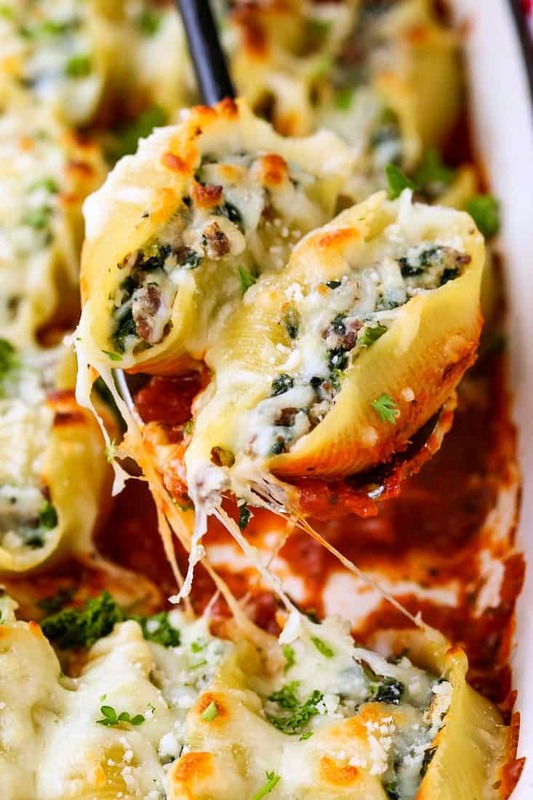 Especially when it’s an easy dinner recipe like these Beef Stuffed Shells! Not mine, but I’m sure you could add some spinach or broccoli or some other vegetable to make it a little more interesting! The point is that all you need to do is make a filling, pick your protein (or not) cheese and a vegetable (or not) and stuff it into jumbo pasta shells. 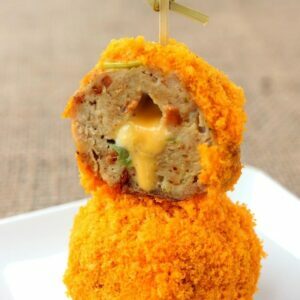 Cover with cheese and sauce and bake. Most of the time we end up using our favorite jarred sauce but of course you can also make your own marinara sauce and use that too! Stuffed shells are a perfect make ahead recipe! That makes dinner easier and parties easier, too. You can make these stuffed shells completely ahead of time, baked through, and then reheat them when you’re ready. Or you can make the filling and stuff the shells then keep them in your refrigerator. Bake the shells for about 45 minutes and dinner is served! 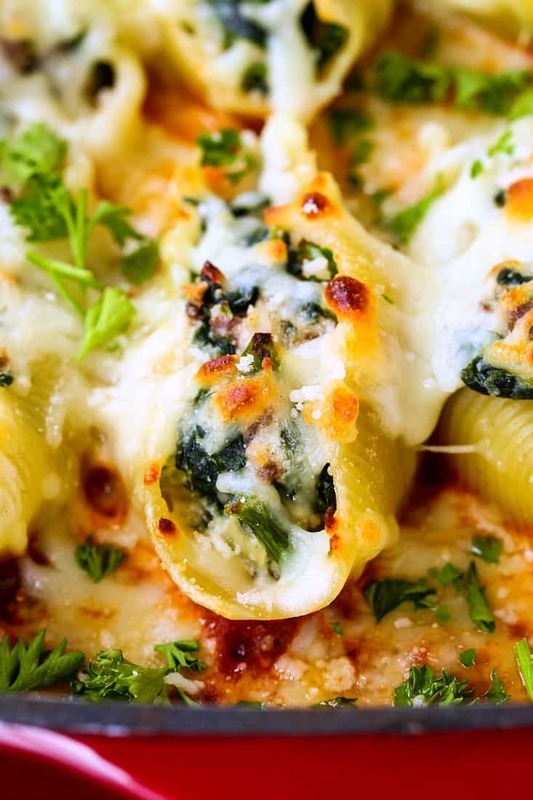 If spinach isn’t your thing, you can definitely leave it out of this stuffed shell recipe. A good substitution would be chopped broccoli, but you can leave it our altogether and just use the beef and cheese. We like to try and sneak in some more vegetables when we can but you totally don’t have to. And if beef isn’t your thing you can swap the beef out for ground pork or turkey, too. I’m pretty sure the ricotta cheese has to stay here in this stuffed shell recipe so hopefully we’re good with that! 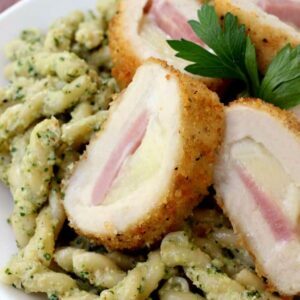 Another great swap out for this pasta recipe is that you can use a jar of Alfredo sauce too. 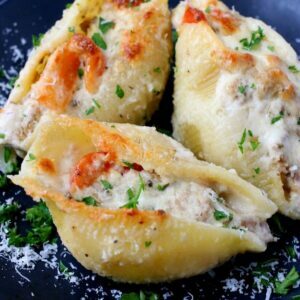 Or your favorite homemade version – but a cheesy, creamy sauce with these stuffed shells – will be crazy good. Because we can all agree that it’s all about the melted mozzarella cheese on top. 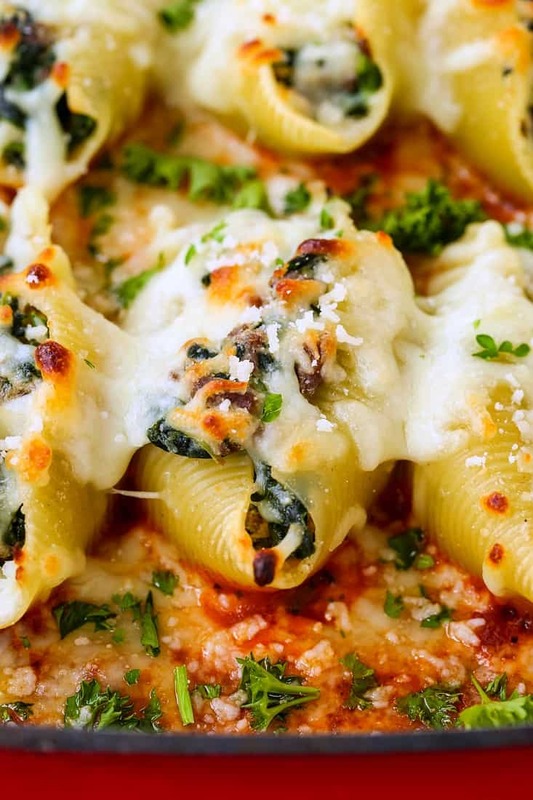 Once these shells are baked and thy get slightly crispy on the edges…it’s pasta perfection. Now on that note, if you are one of those people who prefer their pasta soft and not crispy on the edges, just leave the aluminum foil on the whole time and the cheese will still melt. You might have to give it a few extra minutes in the oven but it’ll get there! These super beefy, super cheesy stuffed shells are so easy to make! You can make this pasta recipe ahead of time and have it ready when you are! Add the oil to a large skillet over medium heat. Add the diced onion and cook until softened, about 5 minutes. Add the ground beef to the onions, breaking up with a spoon to brown through. If there is a lot of grease after the beef cooks you can drain it and add it back to the skillet. Add the spinach, garlic, salt, pepper, garlic powder and oregano to the beef. Stir to combine then remove from the heat. Add the ricotta cheese, egg, 1/3 cup of the parmesan cheese to a large bowl. Pour in the beef and spinach filling and mix together. Add 2 cups of the sauce to the bottom of a 9" x 13" baking dish. Stuff the shells generously with the filling and place in the baking dish. 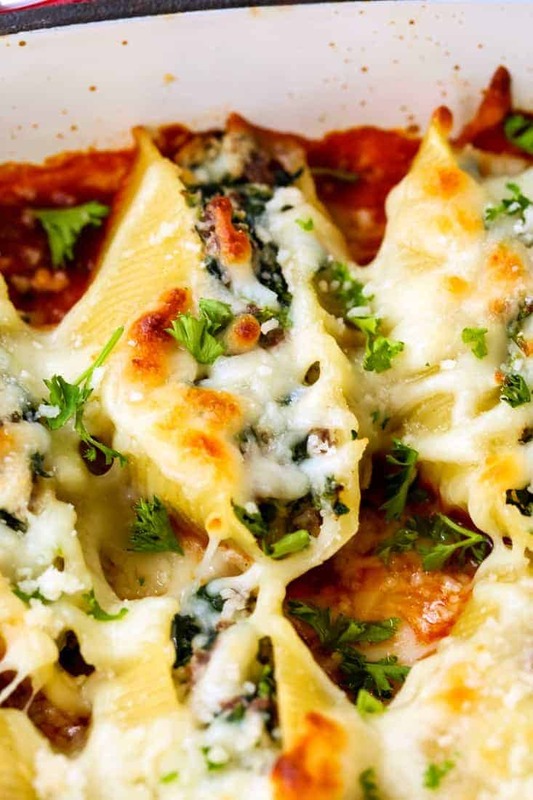 Repeat with the remaining shells, cover with mozzarella cheese and the remaining 2 tablespoons of parmesan cheese. Spray a piece of foil large enough to cover the baking dish with cooking spray, then cover the baking dish and place in the oven for 30 minutes. Remove the foil and return the shells to the oven for another 15 minutes. Serve with warmed extra sauce if desired.